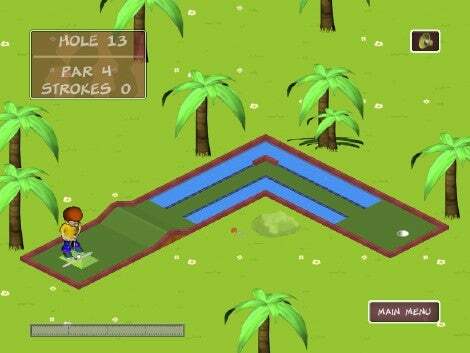 Mini golf is a fun summertime activity, but if you can’t get out to the local mini-links, there are options on your Mac too, such as FunPause’s Garden Golf. This shareware game will set you back $20, and there’s even a one-hour playable demo available for download online. Garden Golf ( ) is mini-golf stripped to its basic essence: There are three 18-hole golf courses here, with plenty of traditional mini-golf hazards: Some water your hole might get dunked in if your aim isn’t precise, a few steep inclines and 90-degree banks, even the occasional grandfather clock or windmill you’ll need to knock the ball through. When you start a new game you’re given the chance to name your golfer, define its gender and determine “normal,” “light” or “heavy” ball action. Then it’s off to the course — there’s no option for multiplayer here, or ability to play a foursome. That’s good and bad — no need to muddle with finicky Internet game matching, but no chance for a “hot seat” competition with multiple players on the same computer, either, which would have increased this game’s family-friendliness. Positioning your golfer is handled by moving the mouse — that will rotate him (or her) 360 degrees around the ball. Click and hold the mouse button and the golfer’s swing speed will begin to climb in a meter on the screen. Let go when he or she has reached the power you’re looking for and let go, and Garden Golf handles the rest. FunPause says that each hole is manageable at or below par with enough practice or logic, and I found this to be true enough. I found the aiming and positioning to be a bit wonky, though — I would have prefer to be able to hold down a modifier key to let the game know I wanted to aim my swing, rather than just having it presume any arbitrary cursor motion was meant for the golfer. GardenGolf touts really low system requirements — only a G3/400MHz or better running Mac OS X is required. And it forces a full screen mode, as well. Overall graphic or sound options in this game are totally absent, except for the ability to turn off music. That’s a bit unfortunate — I would have at least liked the ability to force a “windowed” mode that wouldn’t have arbitrarily changed the resolution of my LCD panel: An amenity I’ve grown accustomed to on many other commercial and shareware games in recent years. Graphics are cartoonish, whimsical and lighthearted — there’s absolutely nothing violent or untoward here, although the absence of detail apart from the hole often left me wanting more. The game features a soundtrack that’s a collection of rather mellow contemporary jazzy-sounding music, and simple but effective sound effects (the occasional “sploosh” in a water trap, for example, or the satisfying “thunk” of the ball in the cup). The bottom line: Garden Golf is an innocuous if unremarkable take on miniature golf. Low system requirements may make it appealing to users of older Macs, though its control system is frustrating, as is its absence of user-adjustable options.